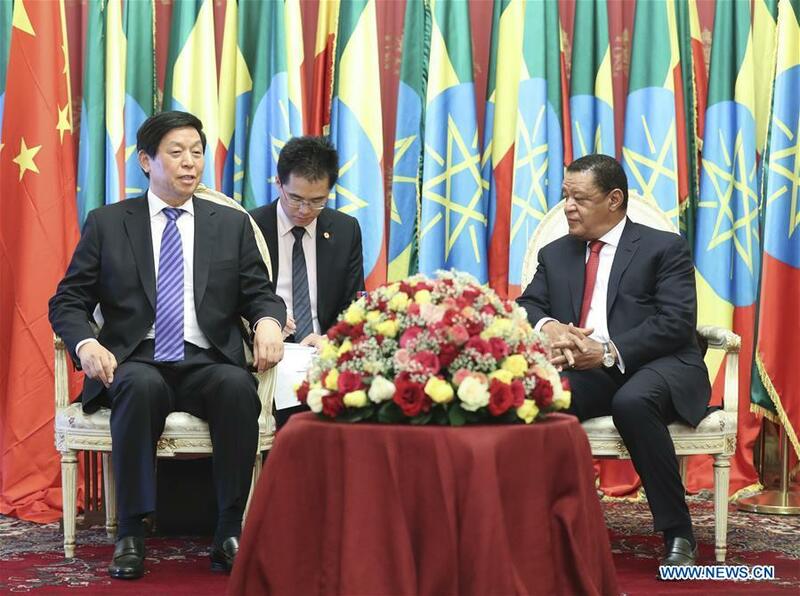 ADDIS ABABA, May 12 (Xinhua) -- China's top legislator Li Zhanshu paid an official visit to Ethiopia from Wednesday to Saturday to promote bilateral ties between the two countries. In the capital city of Addis Ababa, Li, chairman of the Standing Committee of the National People's Congress (NPC), met with Ethiopian President Mulatu Teshome and Prime Minister Abiy Ahmed, respectively, on Friday. During his meeting with President Mulatu, Li conveyed Chinese President Xi Jinping's appreciation of the Ethiopian president's contribution to China-Ethiopia friendship. "The relationship between China and Ethiopia has entered a new stage of comprehensive strategic partnership of cooperation, and the forthcoming Beijing summit of the Forum on China-Africa Cooperation (FOCAC) in September will open up new space for cooperation between the two countries," said Li. The top Chinese legislator said that China is willing to work with Ethiopia to deepen mutual political trust, strengthen practical cooperation, and constantly elevate friendship and cooperation between the two nations. Expressing the Ethiopian side's gratitude for China's precious support, Mulatu said the bilateral ties are now in their best period in history. Ethiopia stands ready to make joint efforts with China to develop the comprehensive strategic partnership of cooperation and better benefit the two countries and peoples. Prime Minister Abiy and Li exchanged views on China's political system and path of development, while Li briefed Abiy on China's governance experience and practices as well as the 18th Communist Party of China (CPC) National Congress and the CPC Central Committee with Comrade Xi Jinping at its core. Li said that five years ago, President Xi put forward the principle of sincerity, real results, affinity, and good faith, and the notion of upholding justice while pursuing shared interests when advancing cooperation with Africa. The president also said that China should combine its own development with supporting Africa's development while being a sincere friend and reliable partner for Africa. Ethiopia is an important partner of China in Africa, Li said, noting that the practical cooperation between the two sides has played an exemplary role in both China-Africa and South-South cooperation. China firmly supports Ethiopia's development path in accordance with the African country's own national conditions and supports Ethiopia's efforts to develop the economy and maintain stability, he said. The top Chinese legislator voiced his anticipation that the two countries should continue strengthening cooperation within the Belt and Road Initiative and the FOCAC framework. They should give full play to the role of the Addis Ababa-Djibouti railway as an economic "main artery," actively construct economic corridors along the railway's route, boost cooperation in the creation of industrial zones and the development of oil and gas resources, and develop new areas of cooperation. Li invited the Ethiopian side to the first China International Import Expo to be held in Shanghai in November. The Chinese leader also said he hopes the two countries will strengthen communication and coordination on peace and security in Africa, and increase mutual support on issues involving each other's core interests. Abiy said that the friendly relations between Ethiopia and China are as solid as a rock. He said President Xi Jinping's thoughts on governance is of important guidance and reference for the development of Ethiopia and African countries at large. Abiy said that the implementation of the "ten major plans" for China-Africa cooperation and the Belt and Road Initiative have brought tangible benefits to Africa and that Ethiopia is willing to continue deepening cooperation with China in the fields of infrastructure construction, finance, tourism, and human resources. During the talks Muferiat Kamil, speaker of the Ethiopian House of People's Representatives and Keria Ibrahim, speaker of the Ethiopian House of Federation Muferiat and Keria, Li briefed the two speakers on China's political system, the National People's Congress and its standing committee. Li said the Chinese side will work with the Ethiopian parliament to improve the legal environment to better facilitate ties. He said the NPC will open a seminar for legislators from developing countries in Africa this year, and he invited Ethiopian delegates to participate. Muferiat and Keria said Ethiopia values cooperation with the NPC, saying the African country is ready to learn from China's development experience and work with China to step up trade cooperation as well as people-to-people exchanges. During his stay in Addis Ababa, Li, together with Abiy, witnessed the signing of cooperation documents between the two sides, and he inked a memorandum of understanding with the Ethiopian parliament. Li also visited the data center of the Ethiopian Ministry of Science and Technology, the Addis Ababa-Djibouti railway and the Addis Ababa light rail.